Hello, would anyone here know how to transcribe the rhythm at the beginning of Harvest Moon: Back to Nature's Title Theme? I've been trying to figure it out for an hour or so, as I can play the rhythm by feel, but when doing the bass walk-up to the main theme that doesn't work, as I have to combine things. 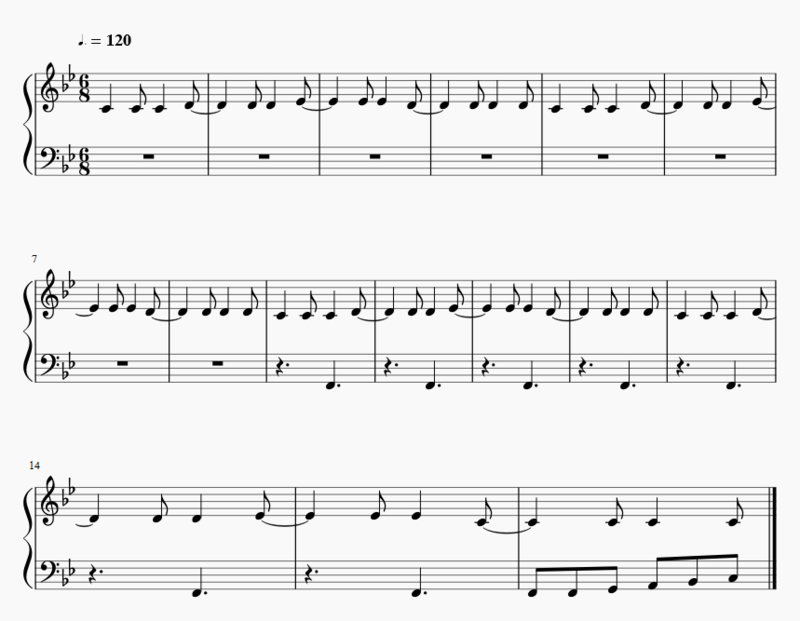 I just noticed the dot behind the note in the tempo mark, that makes it quicker! You should try to rewrite it in 4/4 swing, would look a lot better I think. I'm not an NSM arranger, so a sheet looking good isn't an advantage. It would also be easier to read, easier to practice... your choice. Even with the triplet groupings? I thought it would make it pointless to put in simple time if there is gonna be the whole starter pack of dotted crotchets, crotchet + quaver & triple quavers. I commonly see triplets in swing jazz. I believe swing or triplets depends on a piece's feel and affinity towards jazz. Ah, that would have been nice then... I suppose I should have checked this again before I continued writing it down (which is a bit of a pain in MuseScore 2: it's much harder to use than I remembered it to be). However, the end sounds really lacklustre without the part from the beginning in. Unfortunately, the parts are too far apart to play with one hand, and transposing either of the two down or up an octave sounds weird and plays weird.